September 16, 2012 — What’s a holiday without merchandise? A sincere one, I guess. But that’s not my Halloween. And this year, it seems as if September is out-Octobering October for the amount of sheer Halloween coolness that multi-national conglomerates are trick-or-treating at our wallets with this season. We’ve had some real Halloween highlights in that area already, and it’s only mid-September. That bodes well or ill depending on whether you’re a fangs half in or half out kind of person. Like every great meal, let’s start with dessert first. It seems as if each year there’s a marquee debut in the snack food aisle. Last year, it was Halloween Pop-Tarts. This year? 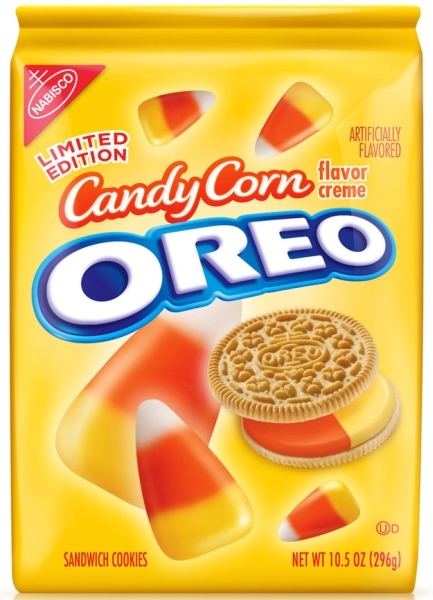 Candy Corn Oreos. And these have gone over huge, at least in the sense that it’s being talked about everywhere online and on TV. 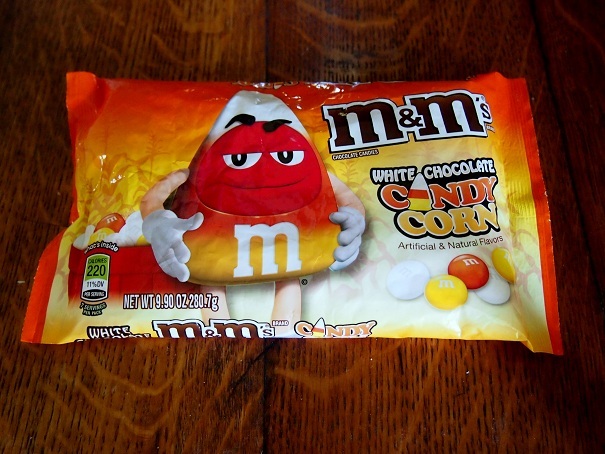 They’ll sell well, too, just like candy corn itself and according to the same equation: its appearance plus tradition minus taste. A lot of people hate the flavor and consistency of candy corn, and that’s probably going to be true in cookie form. And that “a lot” includes me, even as I’m shoveling cobs and cobs of it into my mouth. It’s just not Halloween unless I have a glass pumpkin full of waxy, harvest-colored triangles sitting next to the couch. There have already been so many reviews of this product online from both Halloween die-hards and more mainstream outlets that my usual two cents is worth even less than that on the topic. So far I haven’t tried them myself, and that’s just because I already know my exact reaction. It’s the same one I have for every variation on the Oreo: I’d rather just have a Double Stuf. And speaking of Double Stuf, it’d be a crime if we let all this talk of Candy Corn Oreos overshadow the classic black-and-orange Double Stuf Oreos that by now are as much a part of Halloween as popcorn balls and Garfield’s Halloween Adventure. This year, they have brand new witch-themed packaging in the usual orange and midnight blue color scheme. Nabisco always does awesome on the Halloween Oreos packaging, enough to make me want to decorate using them, and that’s in addition to giving the cookies five different Halloween designs: Witches, ghosts, jack-o-lanterns, cats, and bats. 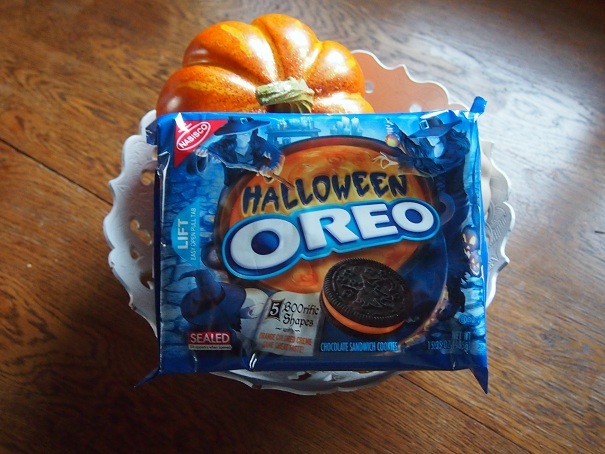 Thanks to them, I long ago started considering Oreo-package blue a Halloween color. Of course, had we not had Candy Corn Oreos this season, the biggest news would undoubtedly be that after years of rumors, Cadbury Screme Eggs finally got a wide U.S. release. 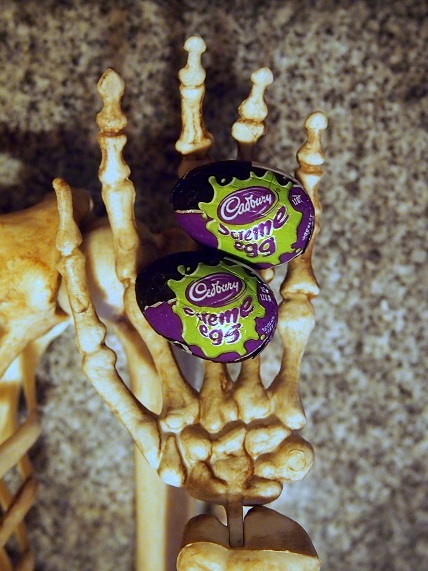 Featuring purple and green foil wrapping and a green yolk instead of the usual yellow, the last cool thing that Easter had over every other holiday is now firmly taken away from it. It now needs to sit quietly in the corner with Presidents Day until it comes up with a way to better brand itself. And with those two giants of Halloween confectionary filling headlines, shelves, and guts, the new candy corn M&Ms just never had a chance. Of course, I’m not showing you anything you couldn’t see just by going grocery shopping, so let me try to do better. My parents just came back from a trip to Nova Scotia, and brought me some Halloween-themed Canadian candy. You can tell because everything on the wrappers is in both French and English. Put out by Nestle, we have Scaries and Coffin Crisp. 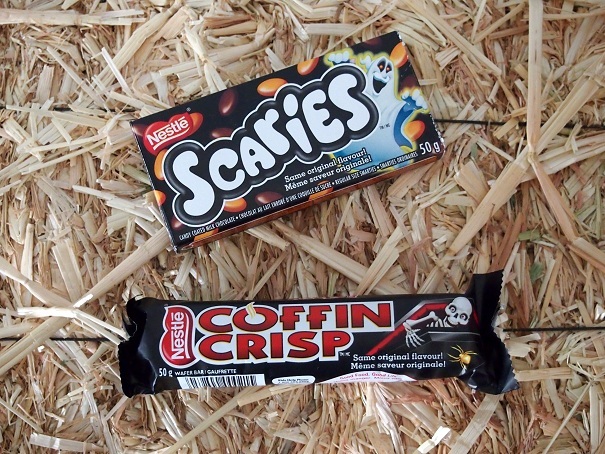 Both are spooky versions of pre-existing candies, Smarties and Coffee Crisp, respectively. We have a candy in the U.S. called Smarties, but these are different than the roll of small, tangy hard candies that we know (in fact, in Canada, those are called Rockets). Canadian Smarties are thin, candy coated discs of milk chocolate. Apparently, they’re as auspicious as a candy can be, since they’ve been around since 1882. They’re also pretty popular worldwide, even though they’ve never penetrated the U.S. market. Ordinarily, the discs come in a rainbow of colors, but the Scaries version is black and orange. They don’t taste too bad, the chocolate being a little less subtle than what I’m used to, but they definitely taste way better for being renamed Scaries and having a ghost on the box. As to Coffin Crisp, it’s a chocolate covered wafer bar that tastes strongly of coffee. I hate coffee and everyone who drinks it, so this didn’t do too much for me. That’s too bad. The wrapper would probably be a finalist at whatever passes for a costume competition at the Candy Land Halloween party. Of course, fat doesn’t just happen with bad food. It also helps to be sessile. Fortunately, the Halloween season has given us more movies than usual for that. Besides the raft of horror movies we always get at this time of year, we have three new spooky animated features: ParaNorman, which already debuted, Hotel Transylvania, due out on September 28, and Tim Burton’s Frankenweenie, coming October 5. I wrote about them earlier this year based on their trailers. Just to update, I’ve since seen ParaNorman, and it was everything I want in a stop-motion-animated zombie-ghost-witch movie. As to the other two, we’ll see, but I can at least tell you that they are getting toy tie-ins. Actually, better than toy tie-ins, fast food toy tie-ins. 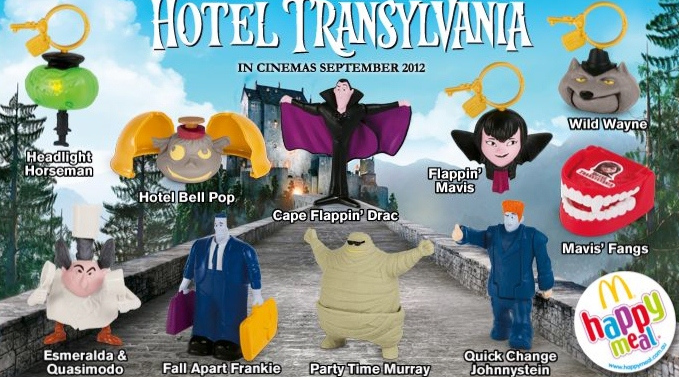 Starting in October, McDonalds’ Happy Meals will feature toys based on Hotel Transylvania. No surprise there. McDonalds usually gets whatever license it wants and also regularly shows up strong for Halloween. 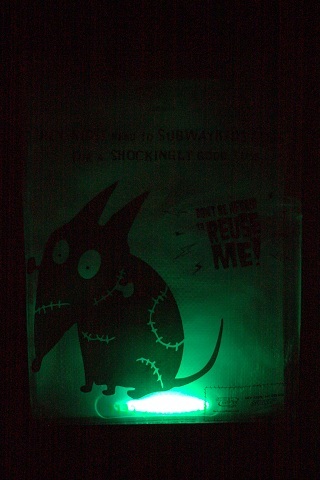 What is surprising is that Subway is also coming with a strong Halloween game this year. 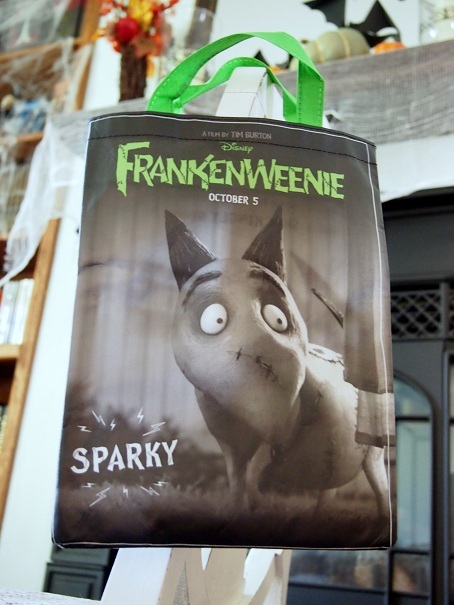 Usually their “Fresh Fit for Kids” meals feature toy prizes so crummy I just order my kid a sandwich when we eat there, but this time the chain somehow grabbed the license for Tim Burton’s Frankenweenie and incarnated that into themed trick or treat bags. The series includes six designs, and they come with a green glow stick (dubbed a “lightning cell”) that you can insert into the translucent bags, temporarily making them the best things on the planet. So we’ve covered stuff to eat and stuff to play with. We still need stuff to create the appropriate atmosphere while we eat an play, though. For that, we've been perusing the Halloween aisles at various stores. So far, judging by where we threw our money, Home Goods wins. 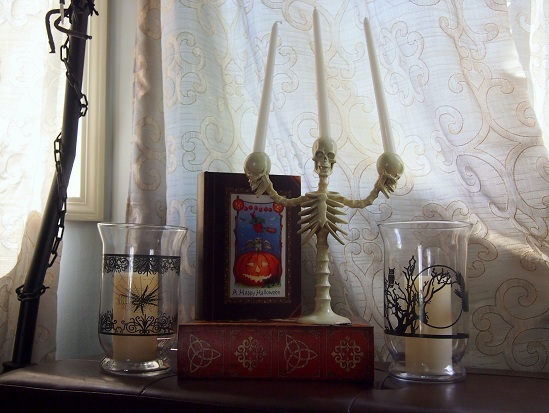 Actually, we win, because now we have a three-skulled skeleton candelabra, spider and owl hurricane lamps, and a couple of Halloween boxes shaped like books. But that doesn’t mean our visit to Home Goods was the only time we had to curtail our daughter’s college fund. 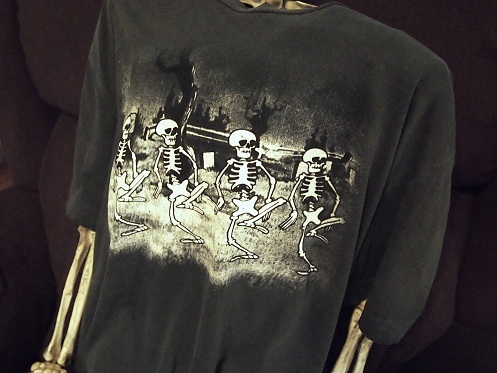 Target just went full Halloween, but even before they did that, I was able to pick up this T-shirt with an image from the 1929 Disney Short, The Skeleton Dance. It’s become part of my official Halloween outfit, and I’ll probably be wearing it in every picture of me that I post for the next month and half. If it glowed in the dark, I’d want to be buried in it. Also, Thanks to Target, I now have a full-sized, poseable skeleton. The times me and this guy are going to have are worth incarnating into a children’s picture book. Honestly, if that’s all the cool Halloween merchandise we get this year, it’ll go down in the archives of my memory banks as a good season as far as that goes. 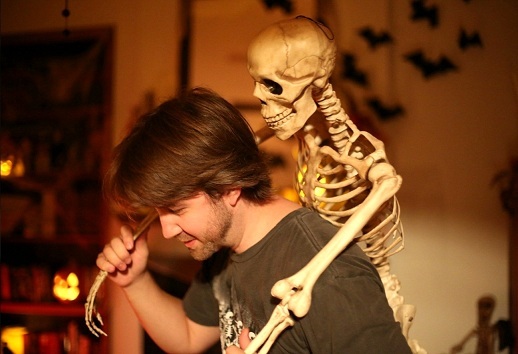 We’ll just have to see if our Halloween future holds even more in store[s]. Probably not. It’s about time to start stocking for Christmas.